For many it is a challenge to find a great staple deep conditioner. Many naturals are also very conscious of the ingredients they apply to their hair. Making your own conditioners are a great way to control what you apply to your hair. Here are some DIY conditioner recipes for all of you do it yourself naturals. All ingredients are natural and can be found in the grocery store. Take it a step further and purchase only organic versions of these ingredients. Gives your hair shine, elasticity, smoothness and increased growth! 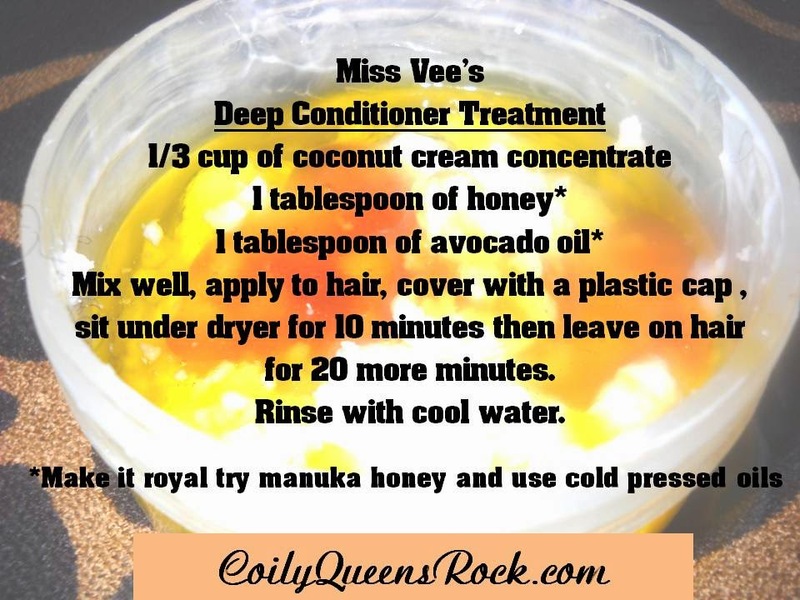 This is the Coily Queens signature conditioner recipe. This conditioner will leave your hair very soft, tangle free and with a natural gloss. Coconut cream: This is made from the meat of the coconut so you are getting full benefits from the coconut. Coconut penetrates the hair shaft making your hair stronger, so it is less likely to break. It smooths the hair shaft leaving your hair less likely to frizz. Treats your dry scalp issues and fights fungus growth on the scalp. Honey: Honey is an emollient, it softens the hair greatly. It is also an humectant this helps the hair retain moisture. Honey is anti bacterial so it keeps infections from forming on the scalp. Honey strengthens the hair follicles and has been known to reawaken dormant hair follicle. Honey is great for stimulating hair growth. Avocado oil: penetrate the hair shaft and infuses moisture into your hair strands. Lubricates each hair strand improving its elasticity. This leaves the hair easy to manipulate. The avocado oil also eliminates frizz thus making your style look way better. Usage: Massage the entire amount through out your hair strands and scalp thoroughly. Cover with a plastic cap, sit under a hooded dryer for 20 minutes. Rinse out with cool water. This conditioner should be used twice a week to see growth and shine results. Use all ingredients no substitutes. 1/3 cup of raw honey + 2 tablespoons of cold pressed avocado oil. This treatment gives you moisture and strength in one application. As a deep conditioner: Apply the whole mixture on your hair and scalp, cover with a plastic cap and sit under a hooded dryer for 20 minutes. Rinse with warm water to remove the honey. Then rinse with cold water to close your hair cuticle. Rinse under cold water for 2 minutes. Massage the scalp for 5 minutes, then apply the entire mix to your scalp and hair. Do this the night before your shampoo day. Cover with a plastic cap, followed by a knit hat or scarf. Allow mix to sit on hair overnight. The honey will treat any bacteria on the scalp and it will go into your hair roots and stimulate hair growth. Do this twice a week and you will see better hair growth in 40 days. Mayo: Softens your hair greatly. It is not a protein treatment but it does add a little strength to the hair by helping the hairs elasticity. The mayo will make your natural curls pop like no other conditioner you have every used. How to use: This is a deep conditioner treatment. Apply all of mix to your hair strands, cover with a plastic cap and sit under a hooded dryer for 20 minutes. Rinse with warm water to remove product. Then rinse hair for 2 minutes under cold water to close the hair cuticle. For those with oily hair. 1/2 cup of coconut cream concentrate + 1/2 cup of raw honey. This conditioner is the same as the Coily Queens signature conditioner except the oils have been omitted. This is a half an half conditioner for those with oily hair. Always use raw pure honey the brown honey is highly processed and will lighten your hair will repeated use. The brown honey will leave your hair soft and still help you to retain moisture but if you do not desire to lighten your hair opt for the raw honey instead. Cleanses and conditions in one step. Mix together using plastic or wooden tools in class or plastic bowl. First mix 1/2 cup of red clay with 2 tablespoons of water. Mix together until there are no more clumps. Add 1 teaspoon of apple cider vinegar, mix together well. Mix in 1/4 cup of coconut cream. Stir until you get a smooth consistency. If your mix is to thick add a little more water. You do not want your clay mix to be watery. Red clay can be messy so you want a thick mix but you want it spreadable. Usage: Apply all of mixture to your hair, cover with a silver conditioning cap for 1 hour or more. Rinse with warm water until all of clay has been removed. Take your time and smooth your fingers through your hair under the water to help remove the clay. Once clay is removed rinse hair under cold water for 2 minutes. PURCHASE YOUR RED CLAY HERE!!! Apply a generous amount of the clay conditioner cleanse to your hair. You should use the whole mixture. Your hair will be red from the clay but it does not dye your hair. Apply the clay in sections taking your time, use clips to pin each section up into loose knots. If you have excess clay left over apply the mix to your face as a great face masque treatment. If your hair is really long you may have to mix up a second batch. This mix is best prepared right before you use it. You can store any leftover in the fridge, up to 2 weeks. Cover hair with a silver/gold conditioning cap, let it sit for 1 hour or more. Do not use heat. Rinse out with warm water to remove clay. Then run cold water over your hair for 2 minutes to close the hair cuticle. Feel how soft your hair is and how your curls pop! So your tried a new conditioner only to be less than pleased with its performance. Upgrade a poor conditioner by adding 1 tablespoon of honey to 1/4 cup of conditioner. You can also add 2 tablespoons of clay to 1/2 cup of conditioner. Honey, red clay and bentonite clay are great staples to keep in your hair cabinet. Add them to your stash today! Great value on bentonite and Moroccan red clay here! More information on the benefits of cleansing and conditioning with clay here! Can I sub another oil for the avocado oil? I'm having a hard time finding organic avocado oil. Should you damp you hair before the treatment. Specifically the first conditioning treatment listed?